Hacienda La Esmeralda is grown in the bouquet region of the province of Chiriqui in the South-West region of Pamana. This area has a mountainous topography, which produces various distinct microclimates, which has a distinct influence on the coffee profile. The fairly cool weather and recurrent mists slows down the ripening of the coffee cherries, yielding a denser and more flavourful bean. Hacienda La Esmeralda is run by the Peterson Family, who bought the farm in 1967. There was always coffee grown on the farm but it wasn't until 1987 that the family decided to grow the crop on majority of the land. The whole family is involved in the production and pride themselves on absolute consistency and excellence in preparation. This is perhaps the reason why Hacienda La Esmeralda has achieved record breaking bids at their annual coffee auctions multiple times and won the Best of Panama award several times. Whole Bean, Freshly Roasted and Ground to Order, Packaged in Resealable Tin with Twist-Top. Hacienda La Esmeralda Grand Reserve is one of the world's most famous coffees. Brilliant and clear acidity with bergamot notes in the cup. Finest geisha in the world. 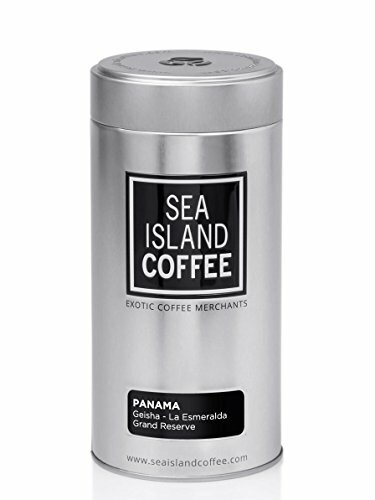 Sea Island Coffee are merchants of rare and exotic coffee. If you have any questions about this product by Sea Island Coffee, contact us by completing and submitting the form below. If you are looking for a specif part number, please include it with your message.